Lenovo has been offering the latest ThinkPad ultraportable notebook series with a screen measuring 11.6 inches for several years. This time Lenovo ThinkPad X121e Notebook comes with a choice of AMD or Intel chips. 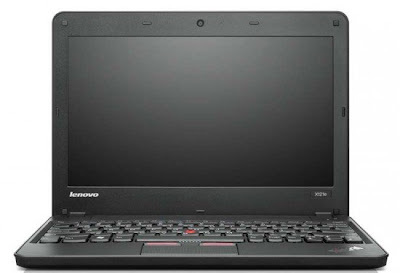 The Lenovo ThinkPad X121e Notebook will be launched initially in Japan and Europe. - 1 GHz AMD C-50 dual core processor with a Radeon HD 6250 graphics. - 1.6 GHz AMD E-350 dual-core processors with the Radeon HD 6310 graphics. - 1.3 GHz Intel Core I3-2357M dual core processors with Intel HD 3000 Graphics. The Lenovo ThinkPad X121e Notebook specs offers three USB 2.0 ports, Gigabit Ethernet, HDMI and VGA output, SD card reader, integrated webcam, and 802.11n Wi-Fi. Upgrade storage configurations can choose a 320GB HDD or 128GB SSD, WiMax radios, six-cell battery, and Bluetooth 3.0. This notebook when running on the AMD Fusion C-50 or E-350 is claimed to achieve 3.5 to 4.1 hours endurance with a three-cell battery, or 7.2 hours with a pack of six cells, whereas variants of the Core i3 said to have reached 3, 8 or 7.7 hours depending on battery options. The Lenovo ThinkPad X121e Notebook price ranging from ¥69,300 ($855) to ¥100,000 ($1,233). This notebook measures 11.4 " x 8.2" x 1.1" with a six-cell battery. A choice of 3 cell battery will also be available for some models. The notebook has a screen capable of displaying a resolution of 1366x768 pixels and will be available with Windows 7 Home Premium or Professional operating system.